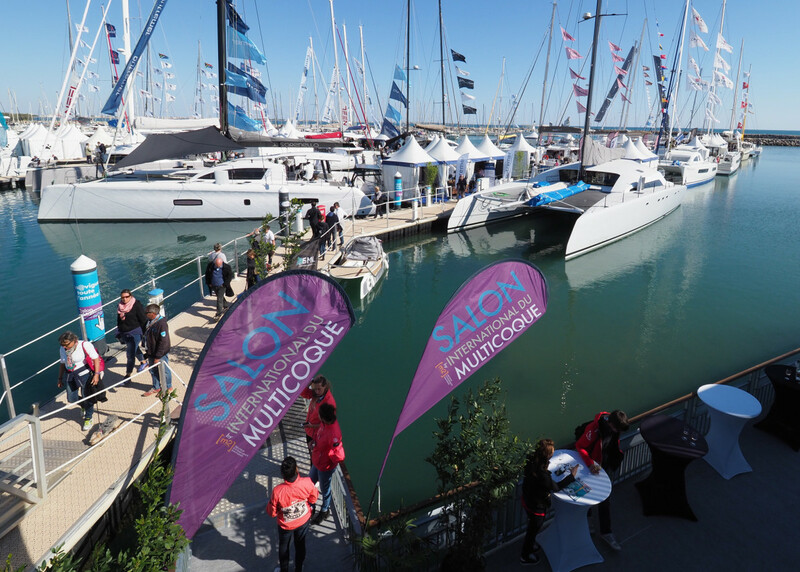 The 8th edition of the International Multihull Boat Show at La Grande Motte in the South of France (from April 19-23) showcased around 60 catamarans and trimarans, with a couple of world premieres. What makes this small, intimate show unique, compared to Cannes and other European boat shows, is the sheer variety of multihulls attracting the aficionados of lead-free sailing. Most visitors are discerning enthusiasts and buyers who come from all over Europe, as well as Mexico, Russia, Brazil and the USA. In a world where global sales of multihulls are growing all the usual suspects were lined up: Lagoon, Leopard, Nautitech, Neel, Swisscat, Fontaine-Pajot, Catana, Corsair, Privilege and Outremer. Fountaine Pajot had the world premiere of their Saona 47, named after a small island off the Dominican Republic. Described as ‘the quintessential catamaran for extended cruising or circumnavigation’, the entire port hull was laid out in style as the owners’ private luxury cabin. It also had a practical hydraulic aft platform. Catana premiered their new 53-footer, launched just a few days before the show opened. The curved daggerboards are claimed to give the catamaran lift as well as ‘dynamic stability’. Weighing in at 14 tonnes, there’s plenty of carbon infusion and carbon sandwich incorporated in the structure. La Grande Motte 2017 also hosted the world premiere of Neel’s new 51ft trimaran , offering unrivaled interior accommodation, 4 double cabins (two with a seaview) plus, a flybridge with helm station and all sail controls to hand. There’s room for 14 in what’s dubbed the ‘cockloon’ – an open-plan space combining cockpit and saloon. For an overview of the project and visit to the factory with Eric Bruneel, managing director of NEEL, click here. Jimmy Cornell, the man who launched the Atlantic Rally For Cruisers and the Round the World sailing rally, was at the show. Now aged 77 he’s lost none of his enthusiasm and was busy discussing future plans with Vincent and Annick Delvoye, who are taking delivery of a Neel 51 trimaran later this year and plan to cross the Atlantic in 2018. The two coolest cats at the show were both high-tech, high-performance luxury, light-weight custom-built cats: the China-built Banul 60, weighing just 9.3 tons, and the new Alibi 57, 12 tons, built in Thailand. The Banul, on show to the public for the first time, is the brainchild of former Hong Kong Banker Raphaël Blot, who wanted a catamaran for family cruising. When he couldn’t find one, he decided to build one himself, choosing naval architect Renaud Banuls who has worked with VPLP on various projects, from the America’s Cup to the Groupama trimaran ocean racing yachts. Thomas Coville, who currently holds the solo around the world sailing record (49 days) on trimaran Sodebo Ultim, was involved in the Banul’s development and was onboard at La Grande Motte’s show opening day. Structural designers HDS, who worked on Hydroptere, the world’s fastest sailing yacht, also had input on the Banul. The result is remarkable. No expense is spared with smart, innovative solutions found in all sorts of areas. The dagger boards are designed as wings, providing lift towards the center of the yacht. The engines are also located amidships to reduce pitching motion. In a bid to shed weight even the toilet bowl is all carbon fiber. The first boat launched was known as MC²60. Boat number two, Dragon, the one on show, was built four years ago. Price-wise, expect a bill of around US $2.5 million. But that includes a lot of optional specs! She has a rotating carbon mast, pivoting twin carbon wheels that can be locked in different positions and her designer/builder Loic Goepfert was one of the chief designers of Yvves Parlier’s Hydroplaneur 60 (a biplanerigged speed machine). Other catamarans that caught people’s attention were Swiss Cat’s new S48, a blue water cruising boat with top-of-the-range equipment (carbon mast, square headed mainsail) designed to be sailed shorthanded. Solarwave 64, was a motor cat owned by an Austrian who wants to enjoy comfort and space with zero environmental impact. The solar-powered cat has a bank of lithium-ion batteries with a capacity of 100 kWh giving 10.5 hours cruising under electric power. Cruising range is expanded as the solar panels charge the batteries while the vessel is underway. There was something for everyone at La Grande Motte– even those with inflated ideas. A company called Big Toys on Board, whose motto is ‘Play it big, pack it small’ had the 16ft 4inch Hurricane inflatable sailing catamaran on display, the latest in the Happy Cat range which goes back more than 40 years. Price? Just 8,500 dollars. No marina berthing bills either. Just stuff in the trunk of your car.